A magazine made out of the ordinary. I ordered Karen after reading about it on Magculture. 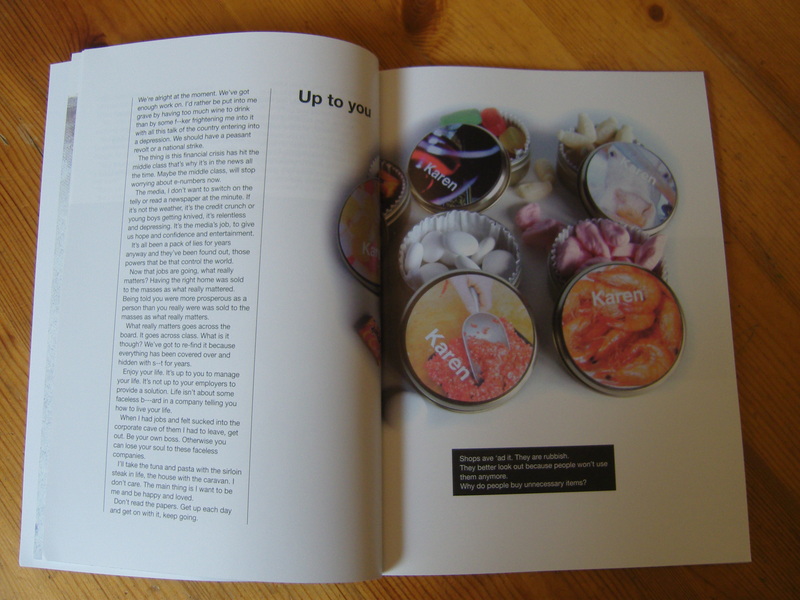 The magazine, put together by Karen Lubbock, has a very simple tagline which makes it something very unlike standard lifestyle junk. It’s about Karen – things she cooks, people she meets, stuff she thinks – but in an unassuming and generous way that makes it, more or less, about everything. The thing is this financial crisis has hit the middle class that’s why it’s in thew news all the time. Maybe the middle class, will stop worrying about e-numbers now. […] What really matters goes across the board. It goes across class. What is it though? We’ve got to re-find it because everything has been covered over and hidden with s–t for years. This is the only part of Karen that’s like a manifesto. The rest of the mag enacts it: what really matters is the food you eat, the people you live among, tatoos, mole trapping, found objects, snips of conversation. It’s absorbing and intelligent. The layout is supremely simple and supple: Helvetica, white backgrounds, point-and-shoot photographs combine artfully and and unfussily to make a magazine that’s beautifully consistent and subtly unexpected page-to-page. Why do people buy unnecessary items? Karen feels like an essential. Jeremy of Magculture talks about the best magazines being “a world apart, a place to escape to”: Karen is a place you disappear into and return from changed, refreshed, more fond and respectful of everyday life. It’s something really and truly out of the ordinary. Looks good, Sarah – thanks for the heads-up! I love the quote about the e-numbers. I also love the quote about magazines being ‘a place to escape to’. I don’t think I’ve felt that about a mag since the ’60s – a fashion/lifestyle mag (although we wouldn’t have used those terms then) called ‘Petticoat’: it was compulsive reading for a teenage girl. 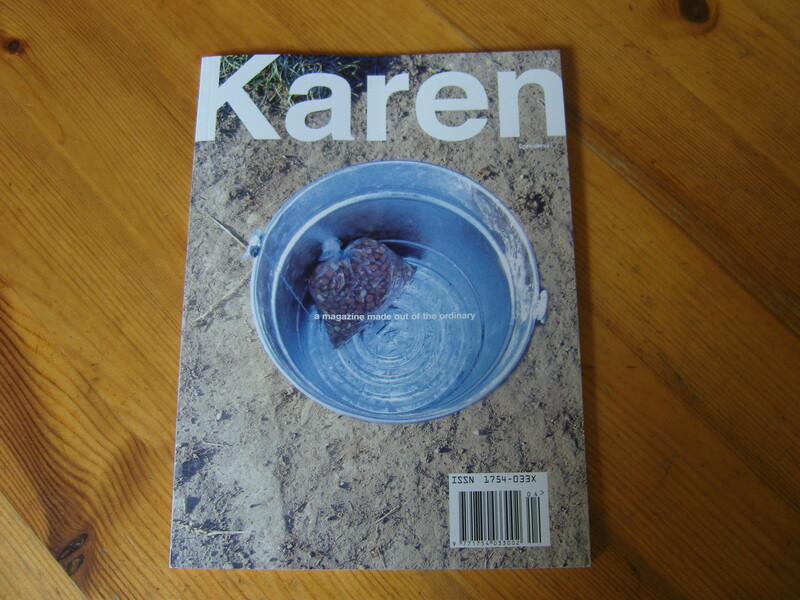 I think you sent me a link about Karen a while back… Karen mag is now one of my most favourite publications ever. 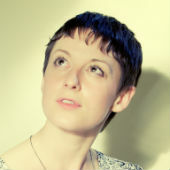 I met her in 2009 to record for a podcast I was working on and she is, amazing. Nice to find your article; I’m just finishing my PhD thesis and this is involving a lot of Internet searching… it’s always nice to find old friends when you’re mired in references and bibliographies.